Target: Marketers, anyone responsible for companies’ social media efforts, small business owners. 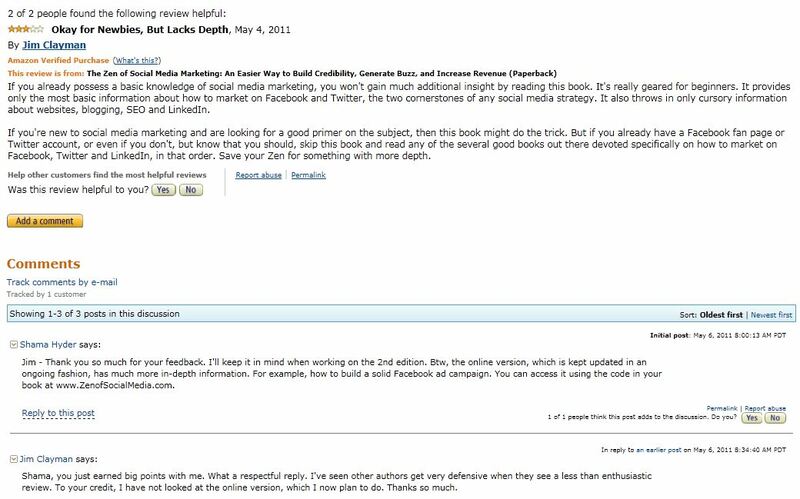 – Great book if you are new to online marketing and social media. 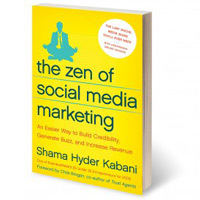 Shama’s book gives a practical overview of social media and its role in digital marketing strategy. 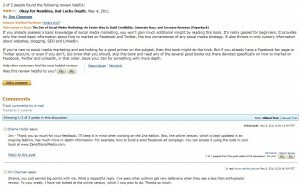 – The book concentrates on four main components of the social media infrastructure i.e. Facebook, Twitter, LinkedIn and Video. You will learn why/how to use them to make the most of your online marketing efforts. – Even though the book is quite basic it contains plenty of tips and good advice. e.g. I enjoyed reading about social media marketing principles, etiquette, “shiny toy syndrome”, how to get more followers on Twitter, Twitter tips for writers and experts, leaders and non-profits. – Chapter 8 “Creating a Social Media Policy” is useful and will help you create a social media policy in 10 simple steps. – Video has become an integral part of social media and chapter 7 contains some practical tips on the basics of video production, how to monetise video content, and pros/cons of hosting on YouTube vs. own website. – It was refreshing to hear from a social media consultant that the website is the best conversion tool and SEO is the cornerstone of any online marketing strategy: “Why a website? It’s expected! It’s efficient. It converts.” So many “gurus” are obsessed about social media and forget about the importance of having a good website. – It’s difficult to create a strategy for something that is changing every second, but it was good to hear that a lot of companies lack a set in stone social media strategy, they only have have policies, rules and guidelines. – It was interesting to read about Shama’s professional approach to Facebook. She looks at it as a business channel and keeps her profile, updates etc. very professional. This probably won’t work in my case – I don’t think my friends are really that interested in online marketing or my work!? But, definitely worth considering reviewing your Facebook profile and what information you are sharing with people who follow you on Facebook. – It demonstrates how stories establish expertise, attract fresh consumers and help convert faster (e.g. testimonials, case studies, video interviews, audio interviews, pictures). – There is a online version of the book, which is kept updated. – “leverage” probably occurs more frequently in the book than “social”. – Case studies at the back of the book are weak and high level. I was hoping to see statistics to back up the wonderful results the social media has contributed to. – The book is very easy to read and written in a conversational tone, but sometimes it’s too basic e.g. I don’t see much value in giving very, very high level SEO tips such as write title and meta tags. It’s probably better to steer away from large topics that are not covered properly. QUOTABLE 3: Albert Einstein: “Everything that can be counted does not necessarily count; everything that counts cannot necessarily be counted.” – In this book, the quote is used in relation to measuring the social media. – I created my personal social media policy and now have much more disciplined approach to social media e.g. actions I will take daily/weekly/monthly. – The book gave me some useful ideas for Twitter content and other blog posts. – I need to experiment with LinkedIn Answers, apparently it’s great for business advice and market research. Firstly, the book is mainly for people who don’t know where to start with social media and need some initial guidance. So, if you already have more than a basic knowledge of social media and online marketing, the book probably won’t change how you do things. You can still benefit from some practical tips and advice though. Secondly, the book is well written and you can’t ask for a more practical introduction to social media. If you are interested in this subject you’ll probably read it in a couple evenings. What a change. Very joyful shoppers.